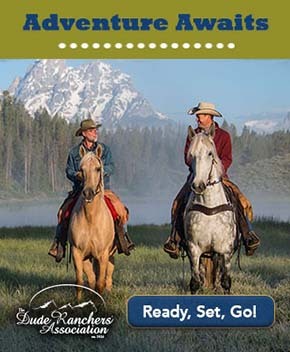 Put on your cowboy boots, because in this episode, Equitrekking explores the rodeo, wild horses, fly fishing and historic ranches of Wyoming on horseback. 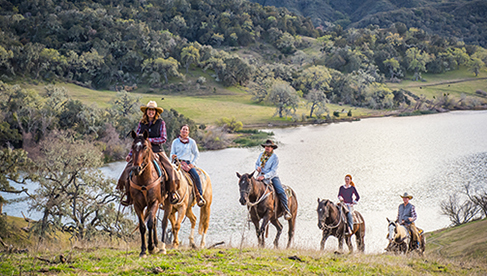 Equitrekking host Darley Newman begins at UXU Ranch for scenic and challenging riding on surefooted horses in the Shoshone National Forest. Darley rides by the majestic hoodoos and up to high elevations to take in views of colorful canyons, glaciers and mountaintops. Next, Darley takes time out of the saddle to explore the wildlife and geology of Yellowstone National Park, before heading to the Cody rodeo. At nearby McCullough Peaks, Darley observes a melting pot of Mustangs and the descendants of horses who might once have been in Buffalo Bill's Wild West Show. Through a local who has been observing the horses for many years, viewers begin to understand how these horses survive in the wild. Darley visits the Buffalo Bill Historical Center's Whitney Gallery of Western Art, before heading South past the Grand Tetons to Jackson Hole. There, Darley embarks on a pack trip with two locals who have been leading riders into the backcountry for over 25 years. Viewers take in the beauty of nature on a ride to Willow Creek in the Bridger Teton National Forest. Finally Darley goes fly-fishing and explores dude ranch history at the T Cross Ranch, which has been family owned an operated since it was homesteaded in the early 1900's.